Today, we spent some time looking at cool new products, and by far, the coolest thing we saw was the Berserker active shock management system from Viking Performance. This changes the game for all the non-active suspension system cars that road race. The Berserker is a derivative of a more complex military application, allowing the each shock in the system to adjust itself according to how the vehicle is being driven. Sensors on the steering shaft as well as the shocks provide information to each ECM, which can make up to 1000 adjustments per second. Yeah, one thousand per second. We are working on getting a system for the Red Dirt Rodz Comet wagon, so we will hopefully have some real world testing. 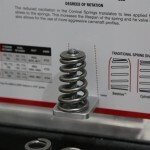 We also saw the new conical coil springs from Comp Cams. These springs will eventually overtake the beehive-type spring, as the new conical springs are stronger and more reliable. One of the key benefits of the cone design is reduced harmonics. A typical coil spring compresses throughout it’s full length, but the conical design compresses less of the length. Additionally, the design lowers the resonant frequency of the spring. The resonant frequency generates harmonics, this is the ringing you hear when you tap a fork on the table. Less stress on the valvetrain means more aggressive cam profiles and higher lifts can be used. 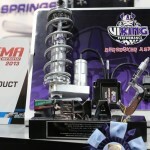 In the end, these new springs revolutionize a component that has not seen much interest in product development. There were no visits to Count’s Kustoms today…. Active Shock Management, this will change road racing for everything that doesn’t have active suspension. 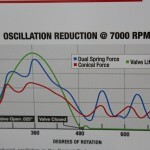 This graph shows the reduced oscillations of the coil spring throughout the compression cycle. Comp Cam’s new conical valve springs brings about an evolution to an otherwise mundane engine component. The Mother’s Shine award winner is just plain gorgeous. I love these suburbans, and this one is probably the best version of one I have ever seen. 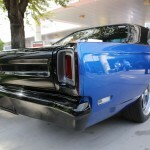 Here is another shot of the Roadrunner. The blacked-out bumpers really set it off. 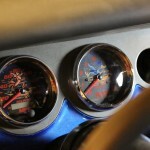 The gauges of the roadrunner are so cool, yet they don’t get noticed. Subtlety was the idea.